1. Are You in the Right Industry? The product/service offering can certainly make or break your success as a brick and mortar. You’ll want to take a good hard look at whether or not your shop can go head to head with online business models competing for the same customer. For example, a book store or DVD rental might not be a good idea. But fret not because not all is lost to Etsy and eBay as there are new and renewed commercial sectors that are seeing strong growth in Alberta, including mixed-retail (one stop shops, so to speak), boutique clothing stores, those that cater to the leisure and tourism sector, and then of course there’s the fastest growing commercial enterprise in the province at the moment. Click here if you can’t guess what that is. 2. Where in Alberta Should You Set Up Shop? This is also a common make or break decision. Location, location, location is the key, but don’t make the mistake in thinking that you should head for the two metropolises of Alberta, because the cost of doing business there can be too much to bear for a new brick and mortar. Instead, look to mixed residential-commercial areas that can still capture visiting traffic from Edmonton and Calgary, while benefiting from municipal incentives and support and the fact that competition is lower. Red Deer is a great example, as is Sylvan Lake. Looking at the latter, we can see that Sylvan Lake is prime for new retail thanks to its newly found all-season resort town status, revitalized economy, and economic indicators that all but guarantee longterm sustainability. View more on why Sylvan Lake (and Central Alberta) is the smart choice for your retail business. 3. Should You Renovate or Build? OK, so let’s say you’re going to sell products that are in high demand and you’ve committed to a prime Central Alberta location. The next important decision, is in regards to whether you should take over a lease and renovate an existing space, or build the store you’ve always dreamed of from the ground up. There are some key things you need to consider here. For one, you’ll have to do some homework to find out if a candidate space meets Alberta’s new commercial building codes regarding energy efficiency (more on this below). Then you need to assess whether or not you can afford to wait for new construction. If time is of essence, a commercial renovation may make more sense. Then, we return to location. If there is no preexisting space where you want to set up shop but there is commercial land available, new construction could present you with a great opportunity. You also need to consider the structural integrity and history of an existing building, in addition to whether or not your intended use complies with existing property zone laws and building codes. View more on the renovation versus new construction debate for commercial businesses entering Alberta. 4. Can You Keep Operating Costs Down Enough to Turn an Early Profit? 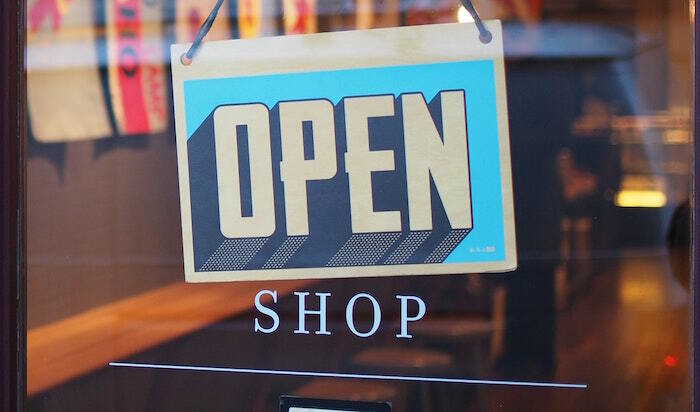 Another important consideration as it applies to the construction or renovation of your up and coming retail shop, is the operating costs that are connected to it. These days, waiting years to break even is not acceptable, which is why you need to cut operating costs as much as humanly possible so that you can focus on bringing in profit. One significant monthly expense that can be reduced with smart construction/renovation, is utilities. By building (or renovating for) a more energy efficient building, you can significantly reduce your heating and cooling expenditure. This can be done through better roofing materials and through superior metal wall cladding. If building from scratch, you might consider insulated concrete forms (ICF). ICF may require upfront investment, but it’s one that quickly returns to you thanks to a typical monthly energy savings of about 60 percent. Opening a new retail shop in Alberta is absolutely an exciting prospect, as long as you have someone by your side to ease the stress of commercial construction or renovation. We encourage you to contact Apple Building Systems at 403.340.6777 today to begin your project with a friendly noncommittal conversation.